English Express have done it again! Real Action’s social enterprise English Language programme, English Express, has won the award for best English school in London for the second year running. A big thank you to everyone who voted for us in the run-up. With your help we’ll continue to make English Express the best place to learn English. English Express,a social enterprise of the charity Real Action, is an award-winning Callan Accredited English language school specialising in teaching adults from overseas. 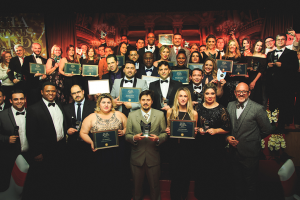 Since our opening in 2003 we have gone on to help thousands of students learn English and find work, and in 2016 and 2017 we were voted best English school at the GUIA Londres Awards. We use the dynamic and vibrant Callan Method, which forces you to speak and think in English from the very first lesson. In just twenty lessons students find a marked improvement in their spoken English and a big boost in confidence. Our students come from many countries around the world and from all different social backgrounds. Whether you are a complete beginner or an experienced English speaker we will find a class for you at our school.